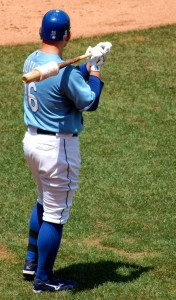 Billy Butler, noted AFL alum. Photo by me. Even though the MLB season is over, there’s still baseball happening, including the league that is pretty much a direct funnel into the Majors. Wait, let me be more specific: Major League greatness is born in this league. Derek Jeter. Albert Pujols. Roy Halladay. Mike Piazza. You have probably guessed by now that I’m talking about the Arizona Fall League. Prospect mavens know plenty about the big names AFL. Scouts drool over games that clump elite prospects together like fish in a barrel. And fans….oh, wait. There aren’t many of those. For whatever reason, people don’t pour into the parks in Peoria, Surprise, Scottsdale. At best, they trickle. Why are all of these ‘Who’s Who in Baseball’ games being watched by thousands of empty seats? ESPN’s Keith Law, who has covered the AFL extensively this fall, thinks it’s partly an issue of awareness among locals. “I talk about going to games and they screw up their faces, like they don’t have the heart to tell me that it’s not spring,” he said. It’s true; the six-team league shuttles talent into the Majors like crazy. Thirteen players on the World Champion SF Giants’ roster played there, as did a dozen of the runner-up Rangers. The 2006 MLB All-Star Game featured twenty-five AFL alums. We’re told all the time that there’s no such thing as a sure thing in baseball, but if there was a sure thing, the AFL would be it. Average attendance around the league is roughly 350 fans at a weeknight game, and 450-500 for a weekend affair. Law says averages don’t quite tell the story, though. “Scottsdale’s stadium is located downtown, right near the Old Town area, so they draw better,” he said, estimating that about twice the league average crowds go to games at Scottsdale, compared to fewer than 100 at an average Peoria game. Royals prospects are sent to Surprise, Kansas City’s Spring Training home, to play for the Rafters. “While Surprise’s stadium is really nice, you have to be hellbent on seeing a game to go there because it’s a hike after you get off the highway,” Law said. Still, for a baseball fan in that area, isn’t that a hike worth taking? Low attendance probably isn’t a huge concern for MLB. Law says the cost of running the league is viewed by MLB as a scouting and player development expense. “MLB doesn’t have the same incentive to market these games that a minor league team’s ownership has,” he said. The gameday experience at an AFL game differs vastly from, say, an Omaha Royals game: It’s just baseball, stripped of the promotions and extras that draw in casual fans. However, the league-owned MLB Network is reaching out to fans nationwide by airing this Saturday’s AFL Rising Stars game. A few years from now, some blogger is going to point out a handful of players in that game who have gone on to be MLB superstars. Is that blogger going to have to wonder why nobody paid attention to those players in the AFL?